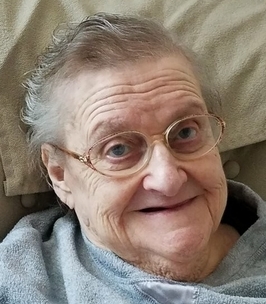 Doris V. (Page) Trudeau, 86, of Somers, wife of the late Florian Trudeau, entered into Eternal Rest at Hartford Hospital on Tuesday, August 7, 2018. Doris was born on July 2, 1932 in Sutton, Quebec Canada. In 1957, with her husband and two sons she moved to the United States and was a long time resident of Somers. Doris was a loving wife, mother, grandmother, and great grandmother who enjoyed spending time with her family and always made sure they were taken care of. After raising her children, she worked in the cafeteria for the Somers school system for many years. During the 1970’s, Doris was involved in the Centurions Drum and Bugle Corp along with her husband and sons. She enjoyed volunteering at the Four Town Fair, where she managed the adult baking department each year. She was also a faithful member of All Saints Church. She was an avid pig collector, loved watching the Red Sox and Yankees play, loved classic country music, especially Conway Twitty, and had a passion for peanut butter ice cream. Doris is survived by her children; Denis Trudeau and his wife Lisa of Enfield, David Trudeau and his wife Tracie of Enfield, and Deana Brink and her husband Larry of Somers; her grandchildren, Nicole Trudeau, Denielle Paradis and her husband Andrew, D.J. Trudeau, Jessica Picard and her fiancé Ray, Kyle Trudeau and his wife Lauren, Nicolas Brink, Aubrey-Anna Brink, and Carolyn Molnar; her great grandchildren, Taylin, Addison, Brayden, and Jayce, two sister-in-laws in Canada and several nieces and nephews in the U.S. and Canada. In addition to her loving husband, she was predeceased by her brother Alfred, her sister Lyndall, and her great grandson Landen. A memorial mass will be held on Saturday, September 8, 2018 at 11 am at All Saints Church, 25 School Street, Somersville, CT 06071 . In lieu of flowers, donations in Doris’s memory may be made to the American Cancer Society, 825 Brook Street, Rocky Hill, CT 06067. Arrangements have been entrusted to Somers Funeral Home. To leave online condolences, please visit www.somersfuneralhome.com. We encourage you to share any memorable photos or stories about Doris. All tributes placed on and purchased through this memorial website will remain on in perpetuity for future generations. We're sorry for your loss. Our thoughts are with you. She was a special lady. Denis, David, Deana and family, I am so very sorry for your loss. I will be keeping you all in my prayers during this difficult time. May you find comfort and peace in all of your memories.